a wide array of ecosystem services. These investments will ensure the Commonwealth is better positioned to take advantage of opportunities to further oyster restoration efforts with federal partners such as the U.S. Army Corps of Engineers, as well as opportunities to further improve water quality and support revitalization of other fisheries. The Chesapeake (meaning “great shellfish Bay” in Algonquin) Bay had historical reefs so expansive, they posed navigation hazards to explorers and watermen. With the ability of each adult oyster to filter up to 50 gallons of water a day, they are a key ingredient to removing pollution and increasing water quality in the Bay and its tributaries. There was a time when the oyster population in the Bay was so vast, the entire 19 trillion gallons of water could be filtered in less than a week — our current population would take a whole year to filter the Bay. Oysters are a keystone species that build three-dimensional reefs. These reefs provide critical nursery habitat for many commercially important species, such as blue crab and striped bass. Restoration is important to increasing the vitality of oyster populations by providing areas for reproduction which can spillover into nearby harvest bars and create disease-resistant stocks. It is estimated that sanctuary oyster reefs provide 34% higher economic value over a 50-year period than traditionally harvested reefs because of their important ecosystem services. 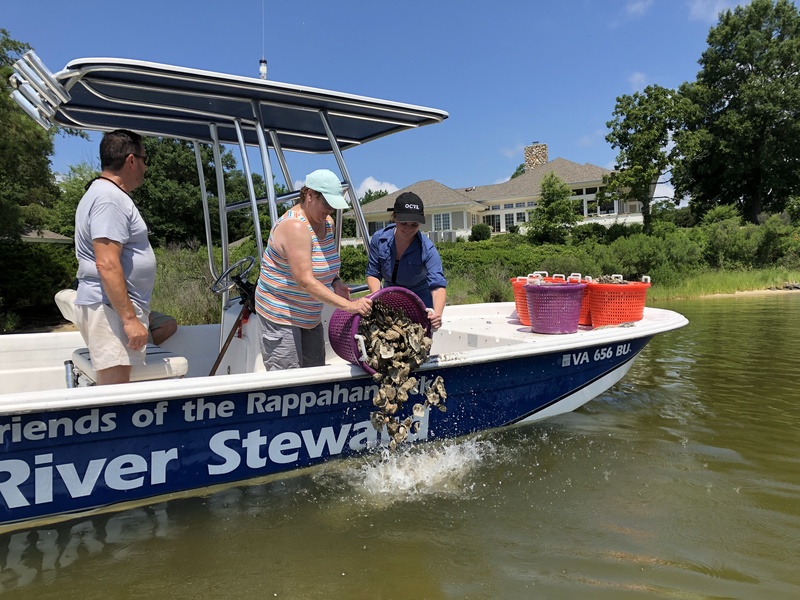 Fortunately, targeted successful restoration efforts are being implemented by a host of federal, state, and nongovernmental organizations to increase the population and meet the oyster goal for the Chesapeake Bay Watershed Agreement. In 2018, the Lafayette River was declared the first tributary in Virginia to meet the restoration metrics adopted by the Chesapeake Bay Program after significant contributions by local partners, the state, and federal agencies. Restoration efforts will now be focused on other tributaries such as the Lynnhaven, Piankatank, and Great Wicomico in order to meet the Chesapeake Bay Program’s goal of restoring five tributaries by 2025. The Chesapeake Bay is one of the last places in the world with a wild harvest oyster industry. Oyster replenishment efforts can help provide the necessary substrate for oysters to thrive and become self-sustaining once again. These replenishment efforts provide both ecological and economic returns to the Commonwealth due to the many water quality benefits of oysters and the increased harvest opportunities for our working watermen. Rebuilding the Chesapeake Bay’s oyster population provides multiple economic and ecological benefits. These benefits include more robust oyster harvests, cleaner water, and more habitat for economically important species, such as blue crabs and striped bass. To increase the replenishment of oysters in the Chesapeake Bay both for restorative and harvestable purposes, Virginia’s biannual budget should include $4 million allocated for wild oyster replenishment and $1 million for ecological restoration.